It is seldom that we come across books that would make us laugh, and smack us in the forehead with the truths at the same time. Those truths of life right at the tip of our noses that we kept squinting at, but then ignored vehemently. I've been exposed to these truths for two weeks. It induced plenty of laughs and urged a lot of contemplating. The author shared some of her experiences, rants, and foraging adventures, while dispensing nuggets of wisdom along the way. I’m really happy that I read them in the morning –starting my day in good spirit. Theresa “Jew” R. Lariosa is a very talented writer. Her capacity to vividly describe each situation with much gusto and heart is more than entertaining. The reader will be scandalized to the point of realization. 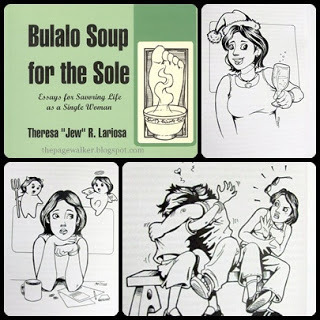 It doesn't matter if you are single or married, BULALO SOUP FOR THE SOLE is a bundle of essays that will give you the confidence to accept your (and not so) Bakya moments, and be liberated. "Come and take a bite."